Metro construction could get in the way of the Friday commute for some riders. 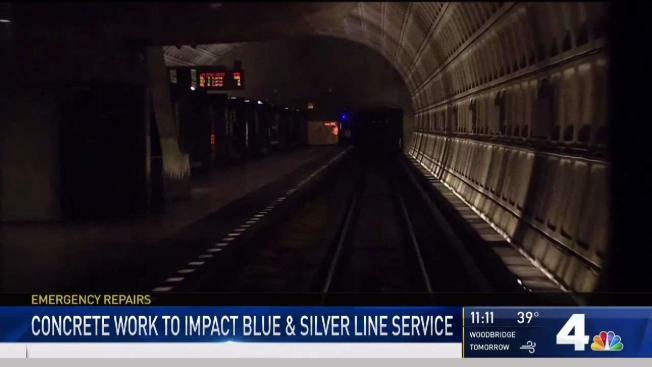 Those who travel using the Silver Line are expected to see wait times of 24 minutes on Friday and into the weekend, Metro announced Friday. The east side of the Blue Line will also be affected, with trains being rerouted to New Carrollton instead of branching off in the direction of Largo Town Center. "Unfortunately, this is a repair job that cannot wait and cannot be confined to a weekend," Joe Leader, Metro's chief operating officer, said in a statement. "To the customers at the 10 stations who will be impacted on Friday, March 16, we apologize and hope that they will consider using stations on other lines or alternate travel options that day." These service changes are taking place so Metro can address a crack in a concrete slab beneath the rails between the Benning Road and Capitol Heights stations. The existing structure has been in use since 1980, when that segment of the Blue line was built, Metro said. Trains between the two stations have been operating with a speed restriction in place until repairs take place starting Friday. "Crews need 72 consecutive hours to complete the work and allow sufficient time for the new concrete to cure," Metro said. The transit organization said it expects normal service to resume at 5 a.m. Monday.